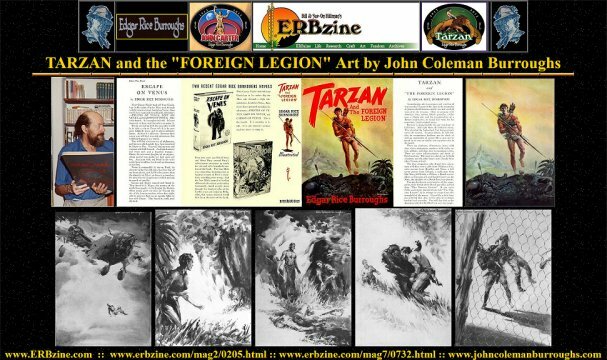 About the time of my second read-through of "Tarzan and 'The Foreign Legion' " I happened to also be participating in a training seminar sponsored by my employer at the time, the U.S. Postal Service. The postal training was necessary for establishment of a management-employee planning group at our office, and as part of the training we were given a brief overview of "group dynamics." I realized that in this novel we have the formation of a group, and the things this group goes through were the same steps outlined in the "group dynamics" study as being typical of all groups that form for however long and for whatever reason. 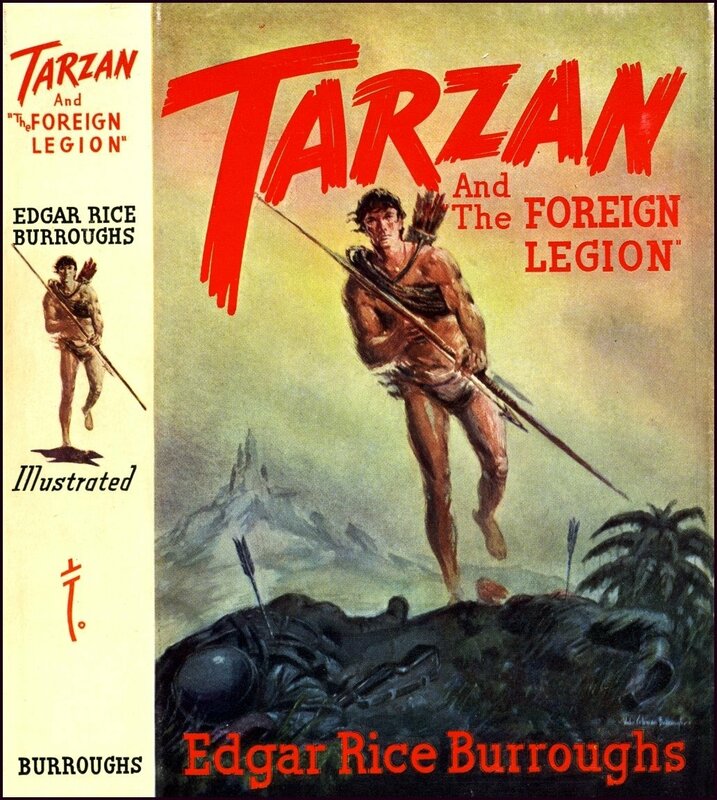 Edgar Rice Burorughs wrote "Tarzan and ‘The Foreign Legion'" well over a decade before Tuckman publicized his rhyming formula, but ERB certainly did understand human nature and the way groups work. So, while he put certain personality conflicts into a story simply to make it more interesting, he at the same time was writing about how real life works. The Postal Service manual illustrated its group dynamics point with a simple story about several people who are waiting for a bus on a rainy day. The bus comes, but instead of stopping, splashes everyone with water and continues on. -- Interaction. The waiting people commisserated with one another, particularly about being splashed. -- Psychological awareness. Each person shared a common identity: They were wet! The people became aware of each other as they talked about the bus driver, the company, the rain, the city, public transportation. -- Perception of a common goal. Getting home. Getting dry. Maybe suing the bus company. -- They share a common problem, that of being in great danger in Japanese-held territory. -- They have a common goal, to make it to the coast and find a boat to escape the island of Sumatra during World War II. When a group is created, the postal manual says, it goes through those four stages "toward the eventual development of the individual members into a cohesive group." 1. FORMING: A person joins a group and wonders, will I be accepted? Will I have any influence at all? Can I be relaxed and comfortable? Can I be friendly with the others? "Forming" is a period for suspicion, fear and anxiety. For wondering who's going to do what, of hesitancy (where do I fit in?). 2. STORMING: During this period, group members become hostile or overzealous as a means of expressing their individuality. It's resistance to group formation. "It's the time for misconception," says the postal manual. "It's the slow realization that there are tasks to perform outside the normal day's activity. Within the group you will see: Infighting, competition, defensiveness, tension, jealousy, hurt feelings, beginning of the 'pecking order'." 3. NORMING: This is the time when the idea that the group is a team, working on a common goal, begins to sink in. "Members begin accepting the fact that they are a team, the idiosyncrasies of other members, their own roles, the vision of the problem at hand. Norming fosters in each team member a newly acquired ability to express feelings and ideas constructively: the team begins to become a cohesive unit; boundaries are established." Not everything may work smoothly, but the team is functioning. 4. PERFORMING: Now, some work is getting accomplished. How are these principles demonstrated in "Tarzan and 'The Foreign Legion'"? The initial group is formed from those who bail out of a U.S. Liberator bomber over Sumatra, after shelling from a Japanese mountain battery does irreparable damage. This group includes three U.S. fliers, Staff Sgt. Joe "Dat Bum" Bubonovitch, Brooklyn, who is of Russian heritage; Staff Sgt. Tony "Shrimp" Rosetti, an Italian American who hails from the roughhewn Chicago district of Cicero, and Capt. Jerry Lucas of Oklahoma City, who boasts Cherokee blood in his veins. The fourth member of the group is our hero, Tarzan of the Apes, British-bred and African-born, who, until later in the book, is known to the U.S. trio only as Royal Air Force Col. John Clayton. --Corrie van der Meer, a Dutch resident of the island who had been hiding out from the Japanese for two years. --Tak van der Bos, also Dutch and a friend of Corrie's, a reserve officer held captive by an outlaw band. --Sarina, a Eurasian, a former employee of Corrie's parents who flees an outlaw band to join the group. --Sing Tai, Chinese servant of Corrie's parents, who helped Corrie flee the Japanese. --Staff Sgt. Carter Douglas, Van Nuys, Calif., and Staff Sgt. Bill Davis, Waco, Texas, two more members of the bomber crew who are not reunited with the rest of the group until near the end of the story. We learn at the beginning of Chapter 2 that there will be conflicts in this story. Shrimp Rosetti is not at all happy that an English officer is to be aboard a plane with him, harboring a distrust of the British based on his perceptions of one of its kings. "Geo'ge Toid." Shrimp won't even smoke a cigarette offered by Clayton. Lucas exhibits "suspicion, fear and anxiety" after parachuting to safety when he finds Clayton, who he knows only as a military man and English nobleman, running around in a Tarzan suit. ERB writes: "An almost naked giant was perched above him. He thought quickly: The guy's gone off his bean. Maybe he hit his head when he landed." Bubonovitch has similar misgivings but, unlike Lucas, expresses them outloud: "You must be crazy." And Shrimp adds: "Where'd you pick up dat dope wid out no clothes?" --A wounded Sing Tai looked at the other members of the group "apprehensively as they approached." --Corrie, rescued by Tarzan, "was terrified. What new horror awaited her?" --Lucas and Shrimp bring up the rear as the party goes through the jungle, keeping as far from Corrie "as possible. They were unreconciled to the presence of a woman...they objected to women on general principles." --Tak van der Bos, a prisoner of the same outlaw band that captures Tarzan, makes plans to escape but has anxiety when Tarzan says, "I can break these bonds whenever I wish." Tak thinks: "This fellow is very sure of himself. Maybe a little too sure. And the Dutchman began to wonder if he had been wise in saying that he would go with him. He knew, of course, that no man could break those bonds." --Sarina, outlaw band defector, receives a suspicious welcome from Shrimp, who threatens to shoot her if she turns out to be a traitor. Storming is not necessarily confined to one sector of time, never to reappear. Sometimes storming goes hand-in-hand with forming, as seen in the preceding section, and can continue into the other phases. People can storm, then norm, and even perform, but go back to storming again as a result of the entry of new members into the group or of new circumstances. Jerry Lucas and Corrie, the novel's chief love interests, begin with a stormy relationship, based simply on the fact that Jerry has had a girl jilt him once and so does not trust any women. ERB doesn't say so, but for Jerry and Corrie it may have been love at first sight, though each had to work through their various stages of storming and norming in order to admit it, even to themselves. Corrie offers to help Jerry bind a feather to an arrow, but he tells her, "I can do this myself. You need not bother." Corrie's feelings are hurt and Jerry apologizes and welcomes her help. "He is a gentleman after all," thinks Corrie. So we see a step toward norming. Corrie had not liked Rosetti or Captain Lucas. "They are both boors," she had thought; but the captain is the worse because he is an educated man and should know better....but since the day she had helped him fletch his arrows, he had been different." The norming stage is "officially" attained in chapter 12, where Jerry says: "I like you." "And I like you, Jerry," Corrie replies. But, there's more storming to come! When Tak van der Bos joins the group, Corrie throws her arms around him and calls him "Darling!" This sets off a whole new wave of resentful feelings on Jerry's part. Is he being jilted again, he wonders. Later, it's Corrie's turn to get miffed, when Jerry, in a state of delirium from a bullet wound, keeps calling out the name "Mabel." Of course, it turns out that there are innocent explanations in each case, and before long Jerry and Corrie are norming and nuzzling again. Perhaps more fun than seeing Jerry and Corrie storm and norm is seeing Shrimp warm to Corrie in spite of himself. He is, after all, the other woman-hater in the crowd. "Let's get after the dirty so-and-sos. They can't take--" Then ERB writes: "He stopped suddenly, surprised by the strange reaction the abduction of the hated 'dame' had wrought." Words turn to action in Chapter 7 when Shrimp, armed only with a knife, leads a charge to save Corrie from a tiger, and two chapters later he places himself in the path of a charging rhino to draw its attention away from Corrie and the group. Another norming highlight is that between Shrimp and the one he ignorantly referred to earlier and for no good reason as a "dirty Britisher." And when one finds oneself alone in a savage jungle with only an experienced Tarzan for help, the norming does not take long at all. As early as Chapter 2, just scant paragraphs after the Americans were thinking that Clayton was crazy, we find that "Quite spontaneously, they all seemed to have acquired unlimited confidence in the big Englishman." Not that the storming immediately ends; it takes Shrimp awhile and his move toward norming is slow. 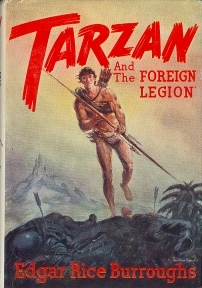 In Chapter 4, Tarzan is missing and presumed dead. Says Shrimp, with grudging respect, "He wasn't a bad guy for a Britisher." But one page later as Tarzan comes back through the trees, bringing food, Shrimp is more enthusiastic, exclaiming, "Wot a guy!" Shrimp mocks the jungle lord as Tarzan starts to make a bow and arrow. "Do we hold de game w'ile he shoots at it?" he wonders. But by Chapter 5 Shrimp "overcame his Anglophobia sufficiently to permit him to ask Clayton to show him how to make a bow and arrow." In Chapter 7, norming is at its zenith for Shrimp as he walks beside the ape-man "watching his every move with admiring eyes. To think, he said to himself, that I'd ever be runnin' around in a jungle wit Tarzan of de Apes." "...since they had left the ship, where Jerry's authority had been supreme, there had been a tacit acknowledgement of Tarzan's position as leader. Jerry realized the fitness of this. There had never been any question in his mind, or in the minds of the others, that the Englishman was better equipped by knowledge and experience of the jungle, acute sense perceptivity, and physical prowess to guide and protect them than were any of the others. Even Shrimp had had to acknowledge this, and at first that had been hard. Now he would have been one of the Britisher's most ardent supporters had there been any dissidents." Tarzan himself does not have much problem with the storming and norming business, spending most of his time performing while others work out their problems. But he is not unmindful of the struggles the others have and is quick to give credit where due, thus helping to complete the norming phase. After Shrimp's courage in distracting the charging rhino, Tarzan tells him: "That was one of the bravest things I ever saw done, sergeant." And Tarzan provides a wry observation on the norming of woman-hating Shrimp and ex-outlaw Sabrina when he says: "If Sergeant Rosetti is satisfied to have any woman around, she must be beyond criticism." Of course, this group, or parts thereof, perform in a variety of ways throughout the book as, under Tarzan's direction and as a result of their own storming and norming, they work together as a team. They learn to make weapons and they learn to hunt; they work together to rescue people from the Japanese and to ward off enemy attacks, and they plan ambushes. They perform when they confuse the enemy by planting false elephant tracks. They even perform without Tarzan by organizing a rescue effort for the ape man when he himself is taken captive. They had come a long way since the best thing they could do as a team was to retreat. In Chapter 9, when Tarzan smelled an elephant coming, he said, "Take to the trees." "He swung Corrie to an overhanging branch as the others scrambled up the nearest trees. Tarzan smiled. They were becoming proficient." There are many other instances of forming, storming, norming and performing in this group. Only some highlights are listed here, as examples. But it might be fun to keep the outline in mind as one reads this book, or other ERB novels in which groups form for short or long times. The Postal Service may still stir a little ire each time it raises its rates on first-class mail, but it's right on the ball as far as giving a new appreciation for ERB's understanding of human relations and group dynamics.